TCS JNK 5a是一种JNK2和JNK3选择性抑制剂.与JNK1和p38α相比,TCS JNK 5a对JNK2和JNK3具有选择性,对JNK3\JNK2\JNK1和p38α的pIC50值分别为6.7\6.5\＜5.0和＜4.8.同时,TCS JNK 5a对ErbB2\VegFr2\Src\Tie-2\Alk5\c-Fms\CDK-2\GSK3β和PLK1都没有活性,pIC50值＜5.0.
. Angell RM, Atkinson FL, Brown MJ, et al. 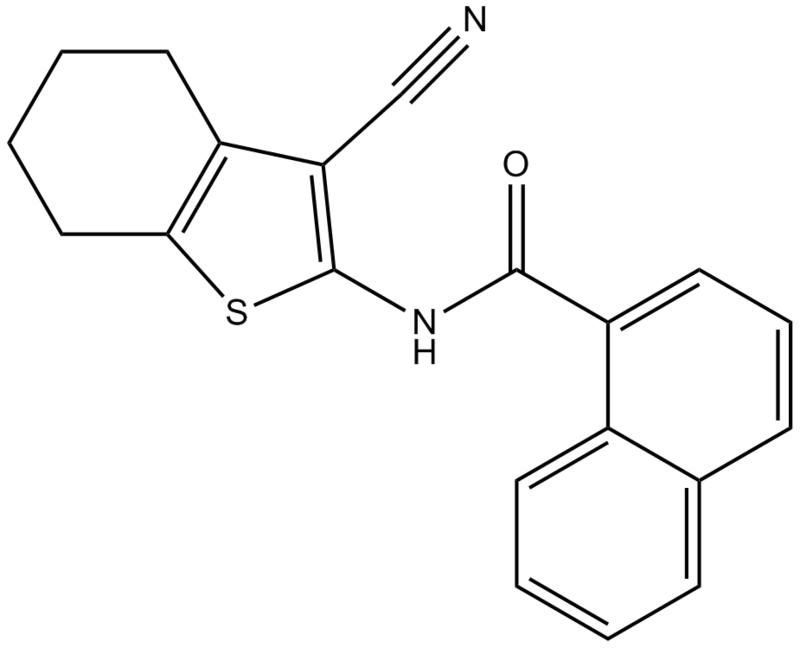 N-(3-Cyano-4,5,6,7-tetrahydro-1-benzothien-2-yl)amides as potent, selective, inhibitors of JNK2 and JNK3. Bioorg Med Chem Lett, 2007, 17(5): 1296-1301.